The initialisation process configures your EPOS application with the recommended default configuration. However, there are several optional settings that may be adjusted to achieve specific operational behaviour. The behaviour of your EPOS application may be fine tuned by adjusting individual settings and then touching the Save button. Note that this button is disabled until you enter a modification and exit the input field in which the modification was made. This is a read-only field. It contains the client identifier that you entered when initialising your application. This is a read-only field. It contains the location that you selected when initialising your application. The secret key that is configured within your Booking Live account. Note that the EPOS application only supports the SHA256 hashing method, so this method must also be selected as the active hashing method with your Booking Live account. The admin PIN that protects access to technical features of the application, preventing cashiers and other non-technical staff from making changes that might disrupt operation. The supervisor PIN that protects access to supervisory EPOS features, preventing cashiers and other unauthorised staff from viewing the financial data or interfering with the critical operations of the EPOS application. When checked, each new cashier session will require the cashier to count the contents of the cash drawer and enter an opening float value, as well as to complete each session by counting the again and entering a closing float value. When unchecked, the EPOS application does not store or reconcile cash float values, so these steps are skipped. When checked, each individual cashier is required to sign into her own account using her allocated PIN code. End-of-day reports show activity individually for each cashier. When unchecked, all cashiers share access to the EPOS application by signing in using the supervisor PIN code and their activity is not individually tracked or reconciled. This mode is not recommended, except in situations where multiple cashiers simultaneously share access to a single EPOS station. When checked, the booking interface will allow a cashier to take a booking on an availability band that has already started. When unchecked, bookings may only be made against complete availability periods in the future. This field is only enabled when Allow Current Band Sales is active. When checked, a warning will be presented to the cashier each time she attempts to make a booking in the current availability band. The number of days in the future that event availability is presented for booking. Set this to 0 (zero) to only show event availability for the current day. The time period, in minutes, after which an inactive sales entry screen automatically locks itself and requires the cashier to sign in again. Set this to 0 (zero) to prevent idle timeout. This is a diagnostic setting. Do not change this unless advised by development team personnel working on diagnosing a specific problem condition. When checked, the sales entry screen will present a 2-tier hierarchy of product groups and their contained products. This mode is appropriate for businesses with many products, since it presents only a subset of products in any context, typically being easier for cashiers to find the desired product. This mode requires that products are suitably grouped with the associated Booking Live platform. When unchecked, the sales entry will present a single tier containing all defined products that are available at the current location. This mode is better suited to businesses with only a small number of products. This setting switches between Grid View and List View for product selection. Grid View presents each product as a rectangular tile with a title and an image (if defined within the Booking Live platform). List View presents each product as a single row in a list, with a title but no images. This view is more appropriate when the majority of products do not have images defined within the Booking Live platform. Pre-Fill Amount: When checked, the payment amount will be pre-filled to match the remaining balance payable. This is typically appropriate for non-cash payments, where the total amount payable is exactly settled using the chosen payment type. 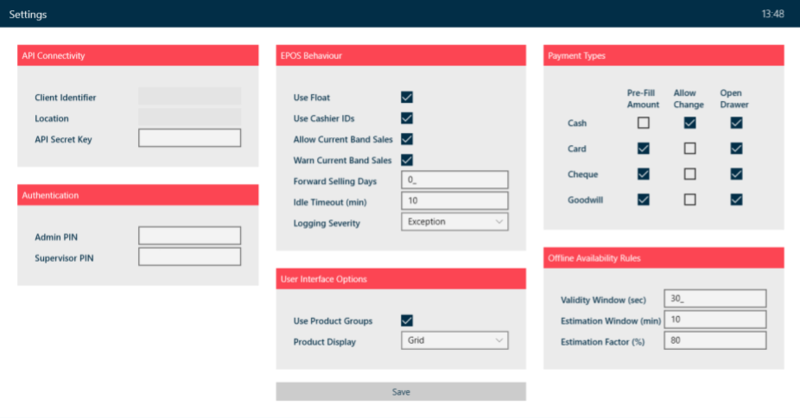 Allow Change: When checked, the payment process will allow overpayment and the transaction journal will display the amount to be returned to the customer in the form of change. This is typically appropriate only for cash payments. Open Drawer: When checked, the cash drawer will be opened when completing a transaction that includes a payment using the corresponding payment type. The time period, in seconds, during which event availability data is considered to be valid and current. During a sale, the EPOS application re-queries the API at this interval, attempting to detect any bookings that might have been made on other (remote) platforms, which might conflict with the current sale. After this time period expires, if the EPOS application is not able to refresh its availability data (for example due to an internet outage) it switches to estimation mode, applying a pre-defined safety factor to minimize the risk of overbooking, while offline. The time period, in minutes, during which availability estimation is permitted. After this period expires, sales are suspended until the EPOS application is able to refresh its availability data via an API call. The estimation window is designed to allow the EPOS to operate during short Internet or API outages. This is the factor by which the last known availability is adjusted, to mitigate the risk of overbooking, while operating offline and using estimated availability. For example, an estimation factor of 80% will result in bookable availability of 80% of last notified availability, for the duration of the estimation window. If multiple EPOS stations are selling the same event inventory, it is necessary to configure each of them, such that their combined estimation factors do not exceed 100% (and will typically be less than that, to afford a safety margin). If your EPOS application encounters an operational problem, you may be asked by development team personnel to check its status and report back with clues that will help to diagnose the cause of the problem. This information is available via the Status feature.